The year after the close of the Civil War should have been a joyous, forward-looking time, but in 1866, a million young men lay dead, buried in shallow graves in places with now-familiar names such as Shiloh, Gettysburg and Fredericksburg. The carnage had focused the nation's attention on the most important matters in life: survival, family and God. Survival had been uppermost in people's minds during the War, even in the North, where hundreds of people were killed in anti-draft riots. Family was on their minds as they looked into the eyes of veterans and remembered those who would never return. And God was called upon by those who survived, to give meaning to the million left on the battlefields and the sacrifices the entire nation had endured. Nearly every county seat throughout the land erected statues to memorialize the fallen dead and the surviving veterans. Concurrently, the Philadelphia Mint created a motto for coinage, a symbol of trust that the sacrifices had not all been in vain. As early as 1861, Treasury Secretary Salmon P. Chase had received proposals that a religious motto be added to the nation's coinage. Patterns were struck off and on throughout the Civil War, and various mottoes were tried, including GOD OUR TRUST, GOD AND COUNTRY, DEO EST GLORIA and IN GOD WE TRUST. The motto as finally adopted came from a line in "The Star-Spangled Banner" by Francis Scott Key: "And let this be our motto, in God is our trust." The Act of March 3, 1865 mandated the addition of the motto IN GOD WE TRUST for all silver coins above the dime and all gold coins above the three-dollar denomination. Christian Gobrecht's Seated Liberty design, in use on the half dollar since 1839, depicted Liberty seated on a rock and surrounded by thirteen stars, with a reverse featuring a spread-winged eagle. In 1866, a new master die for the half dollar reverse was prepared with the motto on a billowing scroll above the eagle's head. This change was the most significant design alteration to occur during the 53 years of Seated Liberty half dollar production. The only other design modification during this "With Motto" era was the placement of arrows by the date in 1873 to signify conversion to the metric system and a slight gain in weight. During the 26 years With Motto halves were struck, 56,323,991 pieces were produced at three mints: Philadelphia, San Francisco and Carson City. The mintmark for San Francisco (S) and Carson City (CC) is located on the reverse, below the olive branch and above HALF DOL. All business strikes from 1866 to 1873 are scarce to rare, particularly in mint state. Specie payments had been suspended since late in 1861, and silver coins continued to be either hoarded or shipped overseas. Although the early Carson City coins (1870-73) were minted in small numbers and, as expected, are very rare today, both Philadelphia and San Francisco struck relatively large quantities prior to 1873. All suffered extensive melting after the change to arrows. 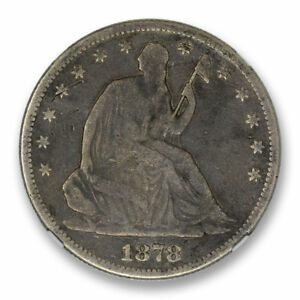 The most notable rarity of this group is 1873-S without arrows, which is unknown in any condition, despite Mint records showing a mintage of 5,000 pieces. 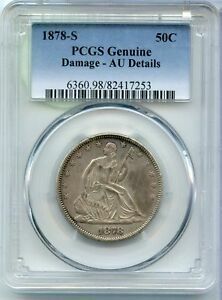 Other major rarities from this period include 1870-CC (virtually unknown in mint state) and the 1873 Open 3 No Arrows, another issue that apparently was almost totally melted and is extremely rare in all grades. Mintages increased dramatically from 1875 through 1877, largely to help in retiring the hated fractional currency notes then in widespread use. With the passage of the Bland-Allison Act in 1878, coinage of silver dollars took precedence over the smaller denominations, and half dollar mintages dropped sharply, creating two additional rarities, 1878-S and 1878-CC. From 1879 on, only the Philadelphia Mint coined halves. although the mintages were minuscule, this was obviously noticed by those with "coin savvy," as many uncirculated pieces exist today. Several hundred proofs were struck each year from 1866 through the end of the series in 1891; many have a "cameo" finish, exhibiting a white mint frost on the devices contrasted against the mirrored "blackness" in the fields. Such coins can be quite beautiful and are highly prized by collectors, especially those assembling a proof type set. Generally, With Motto Seated halves are collected today as type pieces, however, the series is still collected by date and mintmark in circulated grades. Considering the rarities, completing a set can be a daunting task. Of special interest to pattern collectors are the so-called "transitional" proofs. Although dated 1863, 1864 and 1865, these coins have the reverse motto as adopted in 1866. It is now believed that most of these, along with the unique "fantasy piece" 1866 No Motto half, were struck around 1868 under the direction of Mint Director Henry Linderman for the famous pattern collector and Mint "insider," Philadelphia pharmacist Robert Coulton Davis. When grading Seated halves, check the highest portions of the design for wear, i.e., the knees, head, neckline and upper shield . On the reverse, the eagle's right talon, head, neck feathers and the right side of the shield will show friction first. Counterfeits exist in the With Motto half series, the majority being of the more common issues and varying in quality from very good to very poor. All of the rarest issues are known to have been altered by either adding or removing a mintmark from a common coin, including such key dates as 1870-CC, 1878-CC and 1878-S, but other alterations are sure to exist as well. 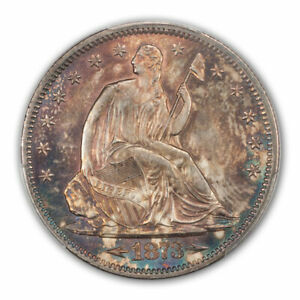 By the 1880s, the Seated Liberty motif was the only coinage design familiar to most Americans. It did have its share of detractors who became increasingly vocal with their demands for design changes. In 1892, the dime, quarter, and half dollar were redesigned by Charles Barber, and the old, familiar Seated Liberty design was finally retired. It had appeared on half dimes, dimes, twenty-cent pieces, quarters, half dollars and dollars at one time or another beginning in 1836 and had been in continuous production since 1839. Spanning the years from the close of the Civil War until the close of the Western frontier, the With Motto Seated half served as a medium of exchange during several of the most important decades in American history. For that reason, if no other, the series will remain a favorite of collectors for generations to come. Bowers, Q. David, United States Dimes, Quarters, and Half Dollars, An Action Guide for the Collector and Investor, Bowers & Merena, Wolfeboro, NH, 1986.